I sometimes sit back and dream about fly fishing, from far off destinations like Alaska, Canada, and Iceland, and also those a bit closer to home like Tasmania’s Western lakes and the back country rivers across the ditch, however for me I find that I enjoy casting as much, maybe even more than actually catching the fish. 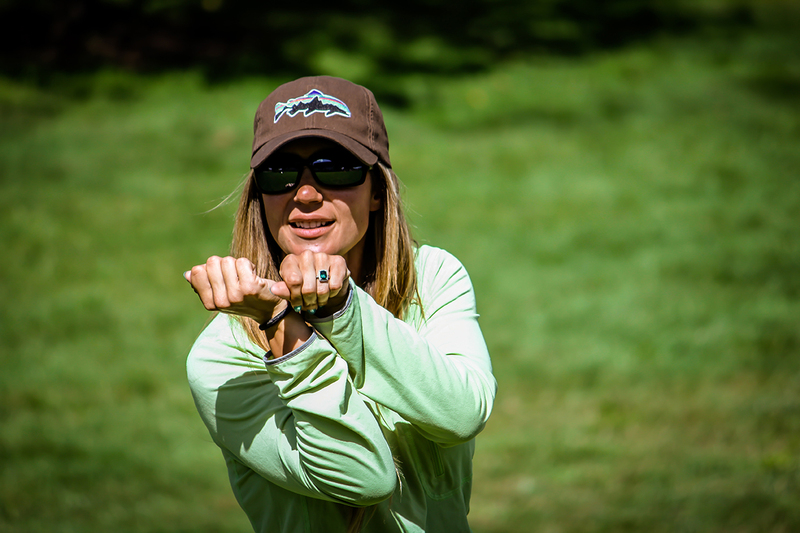 So when I heard http://www.flyshop1864.com.au were organizing “Fly Fest” and the special guest would be fly fishing superstar April Vokey I jumped at the chance to book a casting lesson. I knew I had a flaw in my back-cast but I wasn’t sure what it was. April Vokey explaining the principles of the double haul. 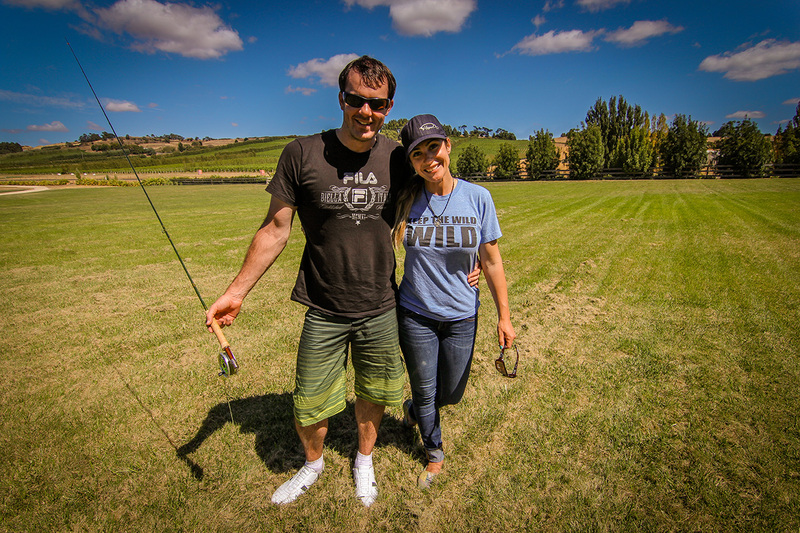 The fly fest was held at the Josef Chromy vineyard over three days starting on Saturday March 2nd, which was the day my casting lesson was on. There were eight of us in the group (6 ladies and 2 gents) ranging from people that had never even held a fly rod before to Adrian and myself who had a bit more experience. 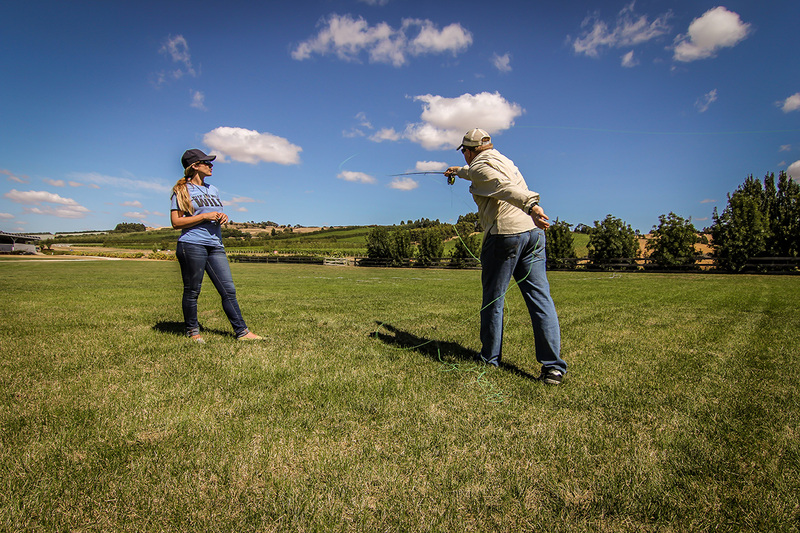 We started out with a brief introduction to fly fishing covering the basics from rods to reels and lines and knots, after the theory side of the lesson was over we grabbed our rods and made our way to the grassy area just a short walk away. 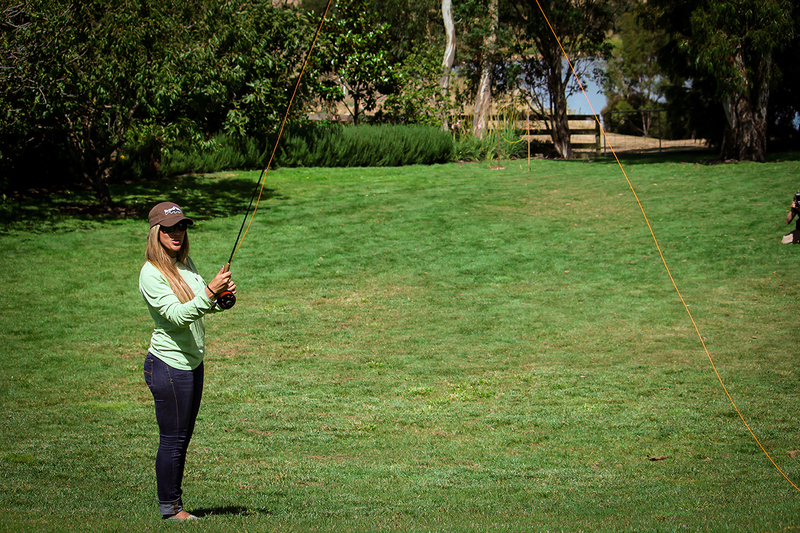 April explained to us the basics of fly casting, how to load the rod, how the path of the rod tip has to be a straight line, the various casting arcs, loop shape and effect, power application and transference of energy to a stop to create a tight loop. 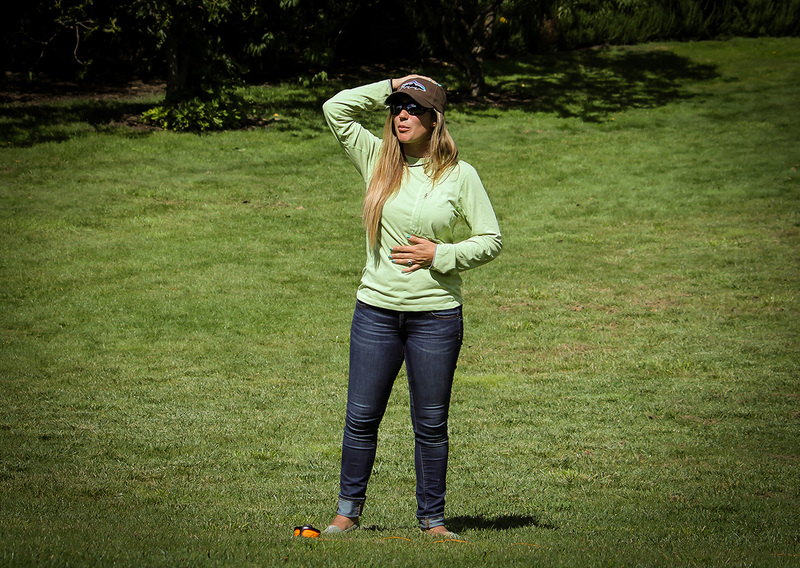 April explaining the basics of fly casting. A large circle was formed and we practiced single hand false casting, NO HAULING!! April came around and individually checked out everyone’s casting stroke, looking for faults in technique, she spotted my fault almost straight away, I have a slight curve in the last part of my back-cast which puts my loop slightly on its side. The reason I do that is because I like to watch my back-cast so I’m rotating my body which makes the path of the rod tip curve out on the last few inches of my casting arc, I was also just slightly rotating my hand during the back-cast. The remedy was to avoid watching my back-cast eliminating my body rotation, and instead of watching the loop April told me to watch the inside part of my thumbnail, I should only be able to see half of my nail but if I can see all of my thumbnail by the end of my casting stroke then I’m rotating my hand and need to adjust for it. April continued around the group and I continued to work on correcting my technique, after 15 or 20 minutes Adrian and myself had started to apply the new technique to our double hauling, which April noticed and yelled out NO HAULING!!! We both had a bit of a cheeky grin on our face cause we were being told off by April Vokey haha. After April had gone around everyone and made adjustments to techniques she proceeded to point out a few flaws to keep an eye out for, The creepers!!! Creeping is a flaw in technique that occurs after either the forward cast or back-cast has stopped. After the casting stroke has stopped the rod should remain completely stopped with no movement( or slightly backwards movement known as drift on the back-cast). Any movement forward after the back-cast has stopped but before the line has unfolded behind you is called creeping, it is a reasonably common fault in casting, to Aprils surprise Adrian and myself were not Creepers!! haha. We then had lunch and prepared for the afternoon session which would be split into two groups, beginners and advanced. If you can rub your belly and tap your head you can double haul. 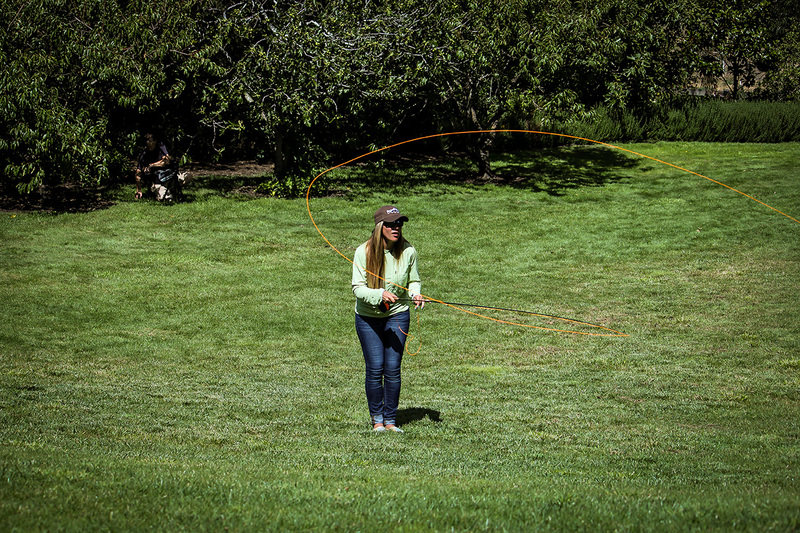 Double hauling is a great way to increase line speed and with increased line speed comes distance, if you want to throw a long line you have to learn how to double haul. 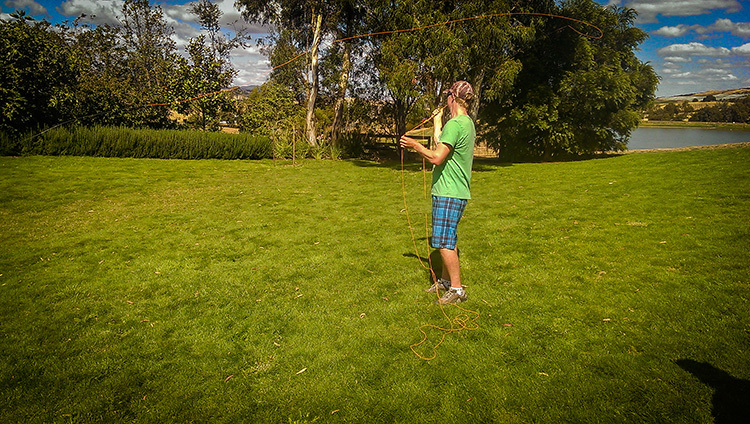 I learnt how to double haul by watching a Mel Krieger casting dvd a few years ago, it takes a while to get the hang of it and you can look really stupid when you first attempt it, there will be line piled up all around you and you may get a few tangles, but stick with it and it will click. Adrian and I were keen to start double hauling and apply the adjustments in our technique, it was really hard to change at first but we slowly got there and the results were noticeable, by the end of the session I could cast the whole line pretty easily with just 2 false casts and April had Adrian’s loops looking really good!! April helping Adrian with the double haul. 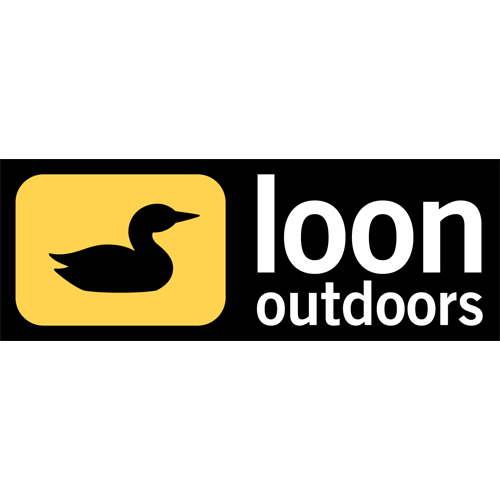 The following day was the meet and greet, spey casing demo and fly casting games. April had a quick talk on the new Patagonia range of womens waders and fly gear, Greg French also answered questions about Tasmanian entomology, and later in the day you could have a cast with a few different rods and get a few tips on casting from April. Fellow iheartthefly contributor Bazzle Brush was after some advice on gaining distance, Bazzle has a really nice cast, but he has a similar fault to what I had only on a slightly bigger scale, Baz was throwing Belgian casts, after getting a few pointers he changed technique but found it very un-natural, old habits are hard to break. Baz Ironing out a few Belgian Waffles. Fly Fest was great.. I really enjoyed it, thanks to Simone Hackett from http://www.flyshop1864.com.au for organizing the event, it was a top weekend!! You got me at Waffles!! !